A few months ago I was on deployment and debating what to do with my stereo when I returned. I had a HT based setup at that point with LSI15's , PRSC5509, processor, oppo, Emotiva XPA5 amp, etc etc. I liked that setup for HT but found the music performance seriously lacking and rather than fighting and switching out components to find stereo performance, with the help of the forum and the friends and family sale, I chose to go with a separate two channel setup for music. Fast forward to now, I moved to maryland and got my hosue and finally had a chance to get all the components together and setup properly (save for proper wire management lol!). Its a simple and budget minded two channel setup but blows my other stereo straight out of the water for 2 channel listening. In the two months I've lived in Maryland, I haven't felt the need to unbox and setup the HT setup in the other room, thinking about just selling it now. Looks great! I see a compilation of components that should really gel well. Welcome to Maryland. I like the simple setup with quality equipment. Right with you on the sound delivery of the 703s. Have mine setup in a small room 14x13 with a Linn Pre, Oppo 103 and (don't bash me) and Emotiva XAP-3 at the moment. Really hard to believe the clarity and realism that comes out of them. Continue to be impressed with the bass capability also. They are very enjoyable. Very nice setup. I bet it sounds better than it looks. Nice set up. I dismantled my HT gear and went back to two channel and it has brought me much more enjoyment. Like Steppenwolf says "...I like to dream, right between the sound machine..."
Thanks everyone! It really does sound great, especially for a sub 3K setup. I have 7K or so in my HT and like I said, this little 2 channel setup blows it put of the water for music. Loving it, and the finish on the LSIM's is just so beautiful. 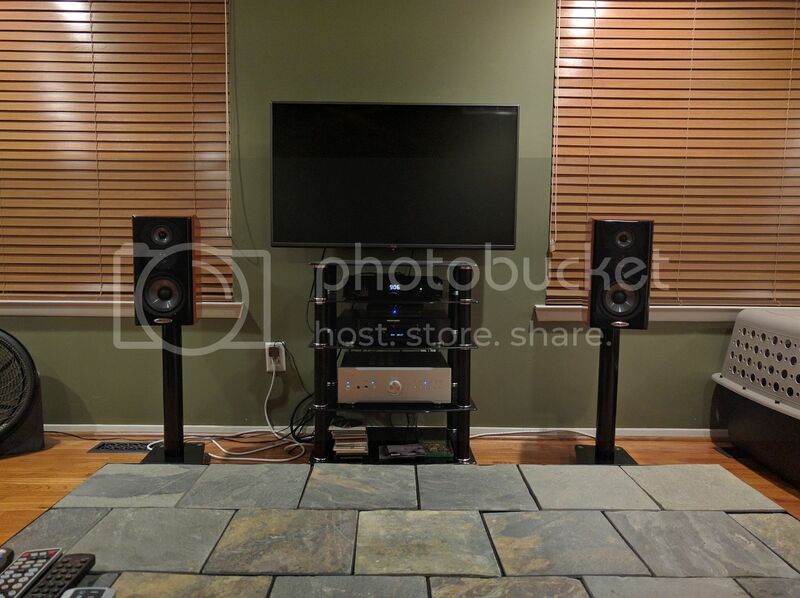 My dad came over a few weeks ago and said the finish on these Polks is much better looking than on his 12K/pair Krell Resolution 1's, that says something to me. Glad you said this because my statement could have unintentionally indicated that I didn't think it looked so great. Definitely a nice looking setup. beautiful setup, man, glad to hear you're enjoying it. when it comes together, it's like you just can't get enough. Curious - I can't quite figure out what I'm seeing here - what are the tile things? Is that the top of a table, or some kind of carpet? or are those real stone tiles? I also have those stands under a pair of my Focal's. They are really nice for the money. Thanks for the idea for the stands. I bought a pair for a friend's LSiM703 speakers, for a birthday gift.